Yay for the weekend! Hopefully, you all have some nice sunshine today and are enjoying some warmth. Today is the Your Next Stamp DT Dare and it is all about Animal Antics! YNS has so many fun animal sets that this is a perfect dare to see some great creations using different sets. For my card, I am using the Window Panel die to set the stage for this card. 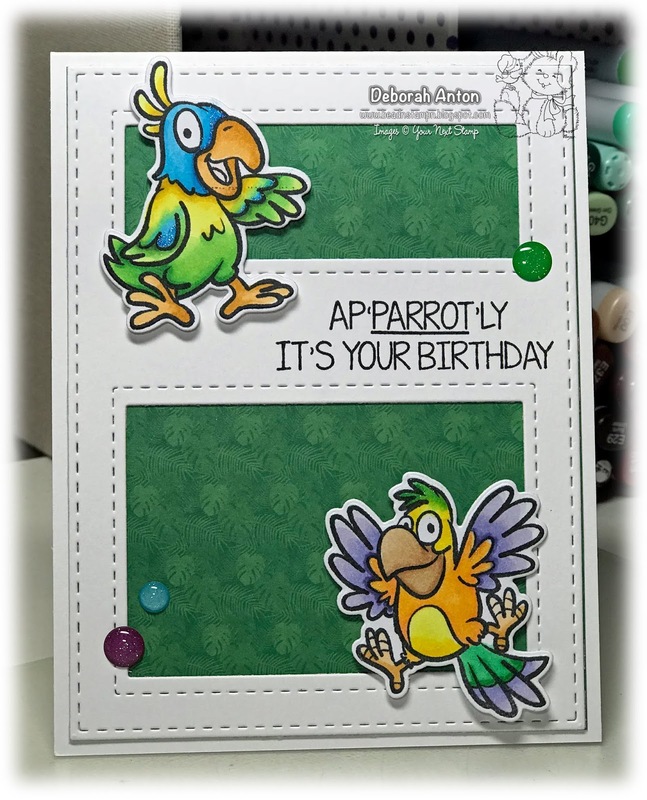 Using the set of Parrot-ise, I stamped the images and colored them in with Copics before cutting them out with the coordinating dies. The patterned paper is from the YNS Tropical Island collection and the gumdrops are the Fairy Magic set. Once the images were cut, I popped them up over the panel and patterned paper to give it a tropical jungle type feel. Ok, maybe not jungle, but lush and tropical! Be sure to stop by the YNS Blog today to see all the fab creations and if you leave a little love, a random winner will be chosen to win a stamp set of your choice! Who doesn't love that? Thanks for stopping by and have a great weekend!